The Foodbank, which opened in Orpington in 2010, is part of a national network of foodbanks which give out emergency food to people in crisis who have nowhere else to turn. Clients are referred to the Foodbank by local care professionals who provide them with a voucher. The voucher is exchanged for up to 3 days’ worth of nutritionally balanced food supplies to help them through the crisis. Just as importantly, they also receive a cup of tea or coffee, a listening ear and signposting to other professionals who can help them. The Foodbank is supported by churches in Orpington and surrounding areas but also by the general public. It is one simple practical way in which we can enable God’s compassion to be shown in our community. 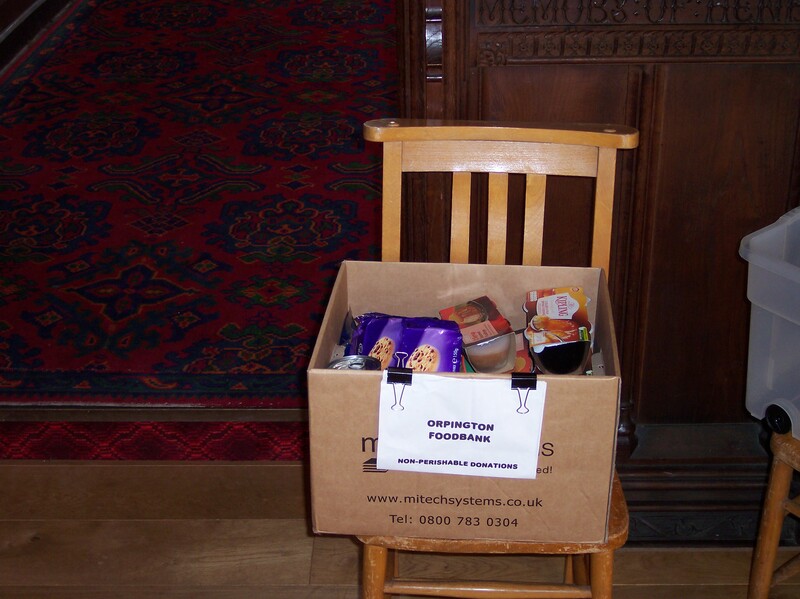 Donations of food can be left in the collection boxes at the back of the church – details of the most urgent needs are given each week in the weekly notices. Orpington Food Bank was the first in Bromley Borough, but as demand grew new branches were opened. Bromley Borough Food Bank now has branches in Orpington, Bromley Common, Central Bromley, Penge and Orpington.